I have to be honest, I'm still angered by the injustice of the referee's decision on Tuesday night to send off Robin van Persie. It has been on my mind ever since it happened. All I can think of now is what might have been. What if we'd finished 11 v 11 - would the result have been different? I personally think we would have been in with more of a chance had we not been reduced to ten men. It is no surprise that UEFA have charged Arsene Wenger and Samir Nasri. Nothing unexpected there. Johan Djourou has expressed his displeasure in the refereeing performance and I don't think a single Gooner could disagree with him. The fallout from the tie continues. Manuel Almunia has spoken of the players being dead on their feet when we were searching for a second goal. And you can understand with the way Barca play that our player would have had to dug deep with regards to their energy levels to keep the pace with their hosts. I just hope this can fire us up for the rest of the season. All to often when we've had a result not go our way we've failed to respond in the right manner. I don't want that to be the case at Old Trafford on Saturday. Bacray Sagna shares my view and wants us to respond in the right manner in the FA Cup. "We are ready to fight because we are even more frustrated after what happened against Barcelona and we want to give more. Everyone is disappointed but we want to bounce back. "We are playing again on Saturday and it will be another big game. We just want to go there and play our football." Jack Wilshere shares the same sentiments. "We have got to pick ourselves up. We have still got the championship, we are just three points behind and with a game in hand. We go to Manchester United in the FA Cup on Saturday and we have to pick ourselves up to get the win there. "We never give up, that is the spirit of Arsenal. We are still in two competitions and need to get a trophy this year, that will be the aim." To come this far and be in a great position with the league and not win something would be very, very disappointing. We were written off at the start of the season and proved many of our critics wrong. However there are those who are still saying we can't win a trophy. That is the final hurdle. Until we pick up a piece of silverware we will continue to have that thrown at us. It will be interesting to see what kind of line up the manager will be able to field in the FA Cup. 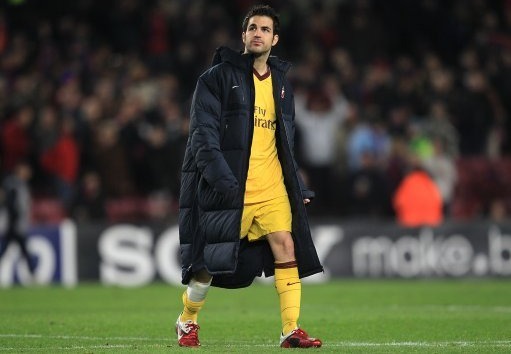 Cesc Fabregas looks set to miss the tie with a reoccurrence of his hamstring injury. Hopefully that won't keep him out for too long. Wojciech Szczesny is almost certainly not going to be involved either. The results of a scan will tell us if he's got anything more serious than a dislocated finger. But that means we've just got Manuel Almunia as our only fit first team goalkeeper. James Shea has returned from Southampton early and looks set to be on the bench on Saturday. Will Robin van Persie be risked against Manchester United? I doubt it. And news has emerged that Thomas Vermaelen won't play this month either. "I don't know when I will be able to play again. It will not be in March. I'm not even yet back in training. This is a tough time for me." That must raise serious doubt as to whether we will see him again this season. Very disappointing news. I'm sure we'll get more on the injury front later in the day via the official site. Let's just keep everything crossed that we are able to put out the strongest possible side on Saturday.